Solar technology has become much more efficient over the past few years. Charging your computer, cellphone or tablet when there is not an electrical outlet available can be very convenient. The sun is a resource that can be tapped to provide free electricity. Many of these solar charging devices are great for backpacking and outdoor use. You can also setup a charging station in your house close to a window that has full sun. It is a great way to save a few bucks on the electrical bill each month. We recommend using these panels in conjunction with a portable battery pack. That way you always have power stored and ready to charge your device of choice. Let’s look at some of the best portable solar panel chargers. For the price and energy output the Anker PowerPort solar charger is excellent portable solar charger to consider. In full sunny conditions, you can charge a basic smart phone in about 2-3 hours from 0-100% battery capacity. In cloudier conditions it will take longer. There is a red indicator light that will turn on letting you know when the electricity is pumping. The solar panels folds up into a 8.5 x 11″ package and is about an inch thick. The solar panels are well protected from the elements with hard clear plastic and are built to last. There are two charge ports enclosed in a pocket large, enough to hold most smartphones and close with a Velcro fastener. You will be able to charge two devices simultaneously. There is a small hook and loop that will hold the pocket shut with a phone inside. The Anker PowerPort comes with several metal grommets which allow you to secure the panel to things like a backpack or hanging system. The solar panels fold up nicely into a compact carrying case when not in use. Great product, very solid and best part it’s good for the environment. 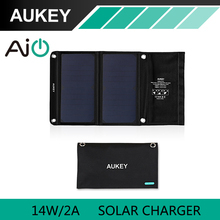 The AUKEY 14W Solar Charger is another good portable solar panel to charge your phone, tablet and battery pack. 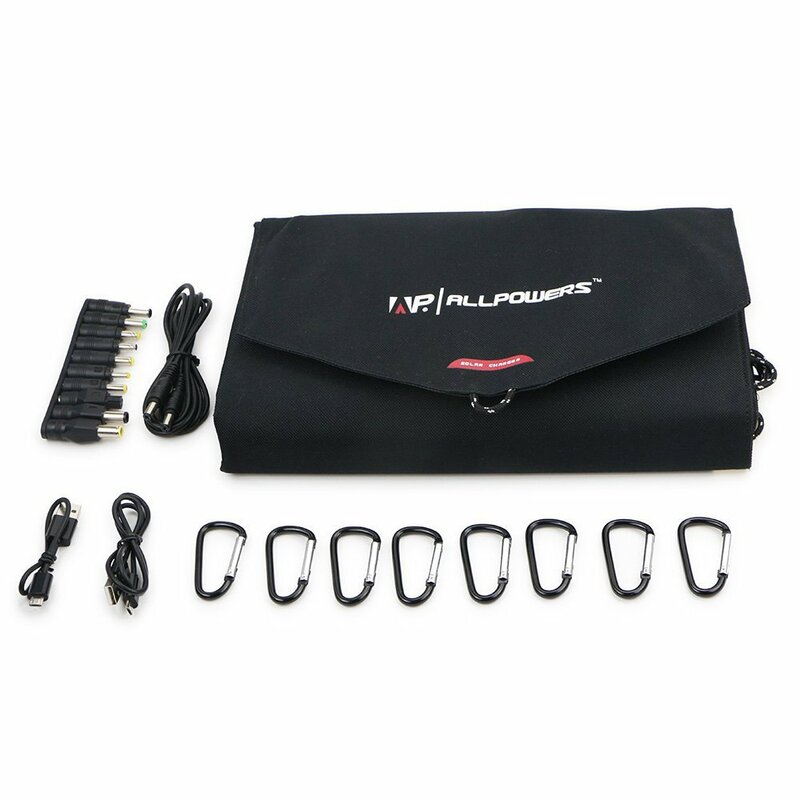 It comes with 4 clips that can be used to strap it to a backpack for hiking and charging. The AUKEY has convenient fold-able solar panels that expand to maximize full sun catching capabilities. This unit does not come with charging cables it has just 2 USB ports to plug into for charging. This product is very well constructed. In full sun it will charge an iPhone 6 just as fast as using an outlet. The quality and craftsmanship of the product is aesthetically pleasing and functional. The solar panels feel sturdy and are behind a matte plastic surface that is scratch and finger print resistant. I would recommend buying a USB extension cable so that you can put this device in the perfect spot while enjoying the comfort of the shade. On a pretty cloudy day this solar panel will offer a solid half amp charge. Nice overall product for the price. The Archeer foldable solar panel charger consists of 3 solar panels that fold up flat and can be easily stored in any backpack. It is slim and lightweight. The Archeer’s 25% transformation efficient solar panels makes it one powerful solar charger. It is constructed of rugged nylon material and the solar panels are sealed and water resistant. It comes with four loop holes that allow for hanging from a backpack or window. 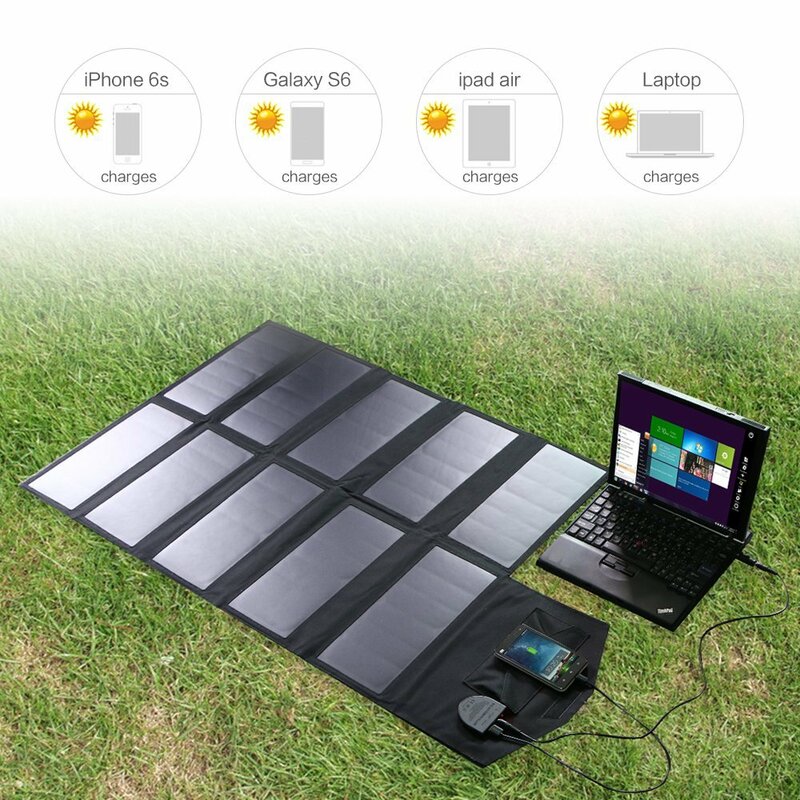 This solar charger can charge 2 mobile devices simultaneously at 2.4 amps each. 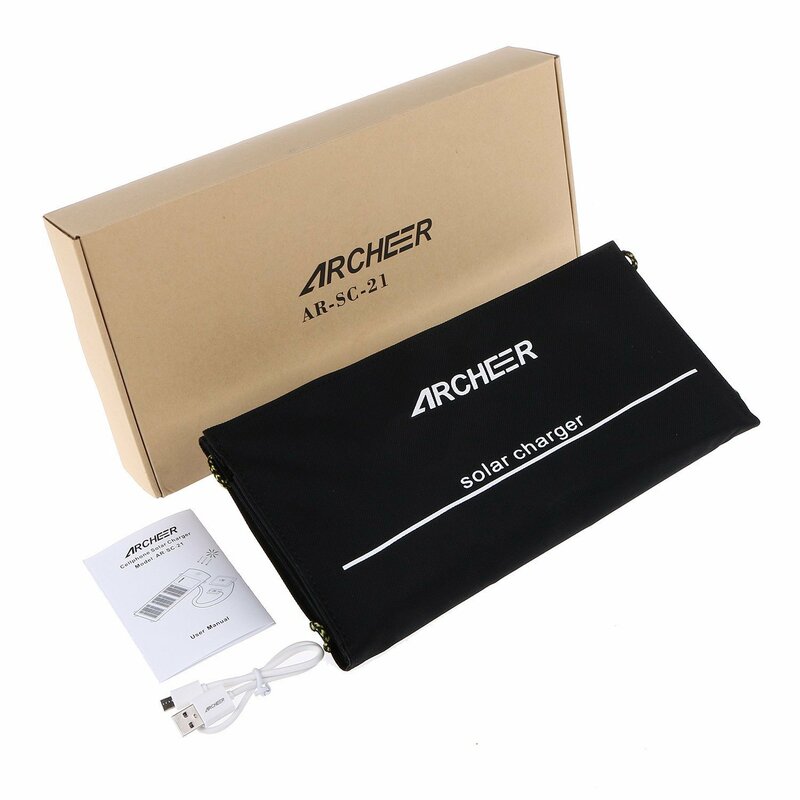 The Archeer solar charger will also auto detect the proper power charge for your device. This helps to protect and give the correct current to the device. This is a sleek, powerful and efficient solar charger that should have a permanent spot in your backpack or emergency kit. See My Full Review of The Archeer Foldable Solar Panel Here. This ALLPOWERS 60W solar panel is more powerful the the other panels listed in this article. This portable solar panel is powerful enough to charge a laptop battery. It will charge a typical smart phone in about 1.5 hours under bright sunlight. It also works very well in indirect sunlight. This device is really good for the outdoor spots where you just don’t have the convenience of an outlet. It is well constructed with good quality solar panels. I would recommend a large capacity battery to charge. You just charge up the battery with the ALLPOWERS solar panel and you have all the power you need night or day. It will charge just about anything with a USB power connection. It is convenient to hang and it folds up compactly. Using a solar panel charger with this portable battery pack will ensure that your device of choice will never run out of juice. Equipped with these portable solar panel chargers you will never have to worry about running out of power. Just place one of these panels in the sun and watch your device charge away.